The fairy tale version of coming up with a new product idea is the eureka moment. But, real life is not always a straight line. Sometimes you stumble across an idea in quite an indirect and seemingly random way. 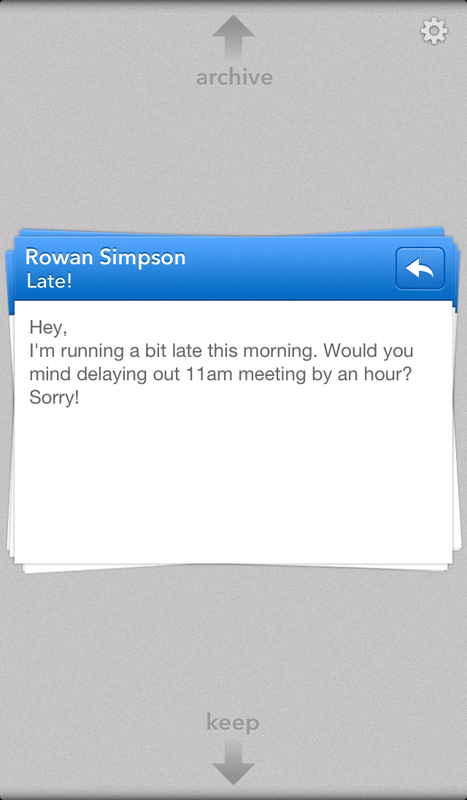 One of my favourite apps, back in the day, was FavIt by Tim Haines. It would display a single tweet at a time (based on top-ranking favourites from the FavStar.fm site). You could flick left and right to navigate through the list or pull down to reveal more information about the tweet and its author. It was a delightful and tactile app, and I would often find myself soaking up the odd spare moment I had when out and about during the course of a day to be entertained by some funny tweets. Sadly, it didn’t survive the transition to the new Twitter API, and eventually stopped working altogether. Mourning its demise, we got to talking about what other types of app would work better with a scroll view rather than a table list view. One idea was dating, and that turned into a bit of a rabbit hole that we went down for a while. However, as I’ve written about previously, the best things to work on are things you care about, have authority in and are prepared to take responsibility for, and that particular idea didn’t really chin any of those three bars for us. Then one day Koz suggested email. Genius! We seem to spend a lot of time fighting our inboxes. That’s certainly something we’d care to fix. “Imagine if there was an app that let me use a spare 5 minutes here and there to quickly filter out all of the emails which I can just read and delete, so that when I get back to my desk I only have to deal with the messages which require a bit more thought and attention”. You really should pay attention to sentences that start with “imagine if…” or “wouldn’t it be better if…” or “what I really need is …”. There is gold in them there hills. We didn’t, of course. At least not immediately. That idea just sat there ruminating. 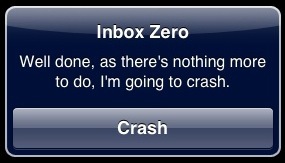 Anyway, who would be stupid enough to build an email client, that sounded like a lot of work…! But, like all good ideas, it kept coming back and demanding some more attention. 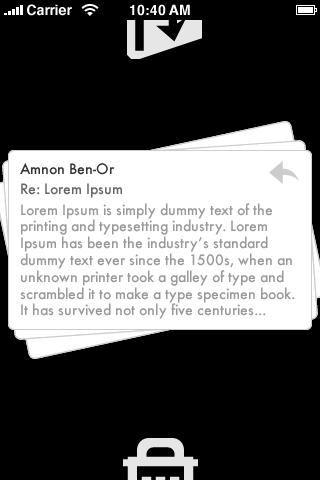 Amnon took that the original idea, and came up with the concept of a stack of cards, one for each newly arrived email message, which you could quickly and easily flick up to archive or flick down to keep for later. When he showed it to us we were both immediately angry that it didn’t already exist. Koz meanwhile had decided that building an email client wasn’t that hard (!) and had started working on that. We decided to share it with some friends anyway. There were some early hiccups (“Archive” can be interpreted to mean “Delete” in some circumstances, right Karl?) Overall the feedback was really mixed. It didn’t fit with the way that everybody used email, and not everybody had the problem we were solving, but those that liked it loved it, which was really encouraging (note: if you’re testing something and don’t hate it, be sure to tell the developer that, your feedback will likely be much more positive than you realise). It seemed that this was a thing that some people might want. Ideas like that don’t come around everyday, so we continued on. “You know what this is like… it’s like triage in an emergency room”. And so we had a name for the app. Triage. It’s first aid for your inbox. Perfect. After a few months and a lot of work, and a bunch more beta testers, and a bit more feedback, and some minor tweaks to the original concept, it eventually got to the point where we weren’t horribly embarrassed by it anymore. And what’s more we were using it ourselves all the time – I’d long since relegated the old Mail app to the folder on the last page along with Maps, Compass and Voice Memos, with Triage taking its spot in the dock. We pitched it to some of the speakers at Webstock, who couldn’t have come to Wellington at a better time in this process. We were flattered when they loved it and offered to introduce us to others in their network who might be interested. The last piece of the puzzle was an icon. We wanted something that would belong on the homepage of your phone, and after a lot of work from Amanda, heaps of different concepts and some help from our friend Bryan in the US we eventually came up with something that we all liked. All that was left were some final improvements to animations, and some additional fun features such as the achievement stamp for getting to the bottom of the stack and the card wiggle if you tap on one of the arrows, plus a one-page marketing site, and we were ready to submit and now today, make it available for sale. I’m sitting here trying to come up with a succinct myth to describe how we got to this point for a blog post, and I’m thinking that the reality, far too long and not easily compressed into a soundbite, is actually much more interesting. Perhaps you won’t mind? I hope lots of you will be tempted to buy it and use it. We’re hopeful that sales will justify the time we’ve invested in it, of course. But, mostly we’re just excited that people will get to enjoy something that we’ve made with pride and will find it useful. If you do, it would make us happy to hear from you and even happier if you would tell your friends. And, if you don’t, let us know too, so we can maybe make it better in the future, or at least be amused by your witty one-star review. Either way, Triage: Email First Aid is available now. Go get it. This week we finally take the covers off a side project we’re calling: Bullseye. If you’re a software developer there are bunch of popular tools that you can use to help you plan and manage your projects: Basecamp, Pivotal Tracker and (the new kid on the block) Trello. In fact we used all three in the process of developing Bullseye. But, as Rod pointed out, none of these are designed for CEOs and Founders to manage high-level strategy and executive teams. Shared, but low maintenance. Unlike other tools that require your whole team to be on-board, you control who has access to Bullseye. You can instantly record commitments from your managers and ensure that each project is contributing to your strategy. Execution, not status updates. Bullseye allows you to make the most of the time you spend with your team, by focusing your attention on the projects and actions that are off-track or not getting enough focus, rather than wasting precious time on status updates. But, don’t take our word for it, there’s a 30-day free trial available to everybody now, so kick the tyres yourself and let us know what you think. It may be just what you need. 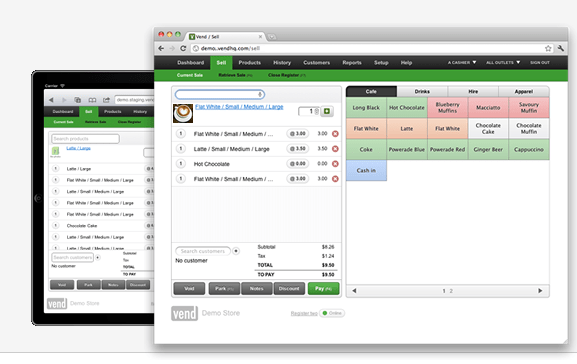 When we started putting Southgate Labs together, about 18 months ago, one of the first people we spoke to was Vaughan from Vend. He had first floated the idea for a web based point-of-sale with me somewhere over the Akatarawa Ranges en route to Otaki, as he cycled the length of New Zealand. By the time I heard from him again he’d built the first version and already had a couple of paying customers. Now that’s what impresses potential investors! In fact they weren’t just customers, they were raving fans. They wondered if the decimal point was in the wrong place in their monthly subscription price, compared to the painful expensive support contracts they were used to, and they found the software itself was beautiful and easy to use. 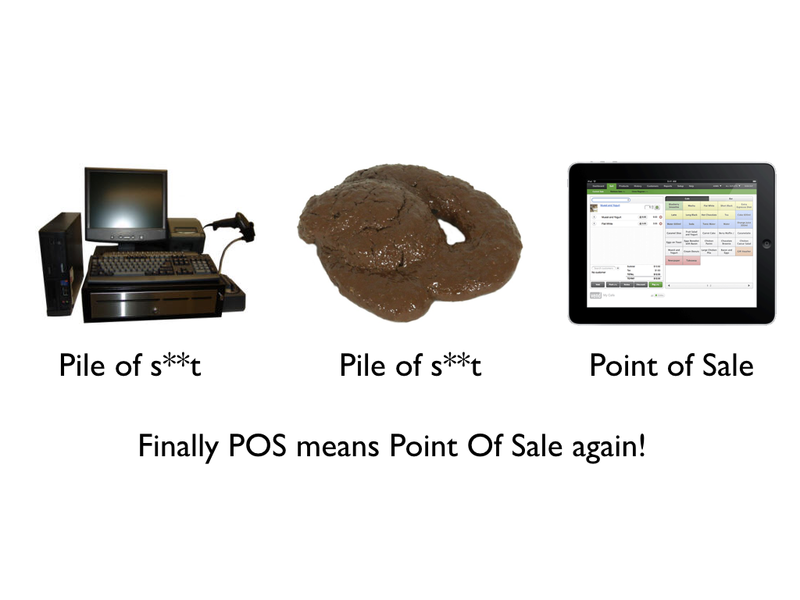 Finally POS means “point of sale” again. It was great to have a chance to invest early and allow him to work on the venture full time. We convinced Sam to invest too. I’ve been privileged to piggy-back with Sam on a number of the early-stage investments he’s done over recent years, so it was nice to be able to return the favour. But, more than that, it was great to have the chance to get involved. We’ve enjoyed helping him push it along over the last year, working on the product design and user experience, branding and marketing site, making introductions where that has been useful, a number of long planning sessions as we all tried to wrap our heads around the opportunity, and basically whatever was required (as is the nature of a venture like this). It’s been fun to see the product getting better and better and the number of customers increasing. So, it’s exciting this week to announce the end of the beginning and the beginning of the next phase in the development of the company. From the very early days we’ve been in touch with Christoph Janz from Point Nine Capital based in Berlin, Germany. They have been involved in a number of successful start-ups, including Zendesk, Free Agent and Geckoboard, and it’s excellent to welcome them into the team as investors and advisors, along with some kiwi angels. If you’re a designer, developer or business development person looking to be part of an exciting start-up then get in touch now. It’s great to be part of something like this. Onwards and upwards from here, hopefully! Predicting rain doesn’t count. Building an ark counts. It’s not enough to know what to do, think about doing it, put it on a list. It turns out that all of those are very common. The only thing that separates you from the pack is actually completing things. To be successful, it seems, you just have to do the things that most people don’t. And, unfortunately, most people don’t do much. So, how do you get better at this? I think that is a really elegant and simple idea, and pretty much the polar opposite of every productivity system and to-do application I’ve used. Rather than combining more and more complex ways of capturing, storing, sorting and retrieving lists of tasks it starts with a focus on completing important things. 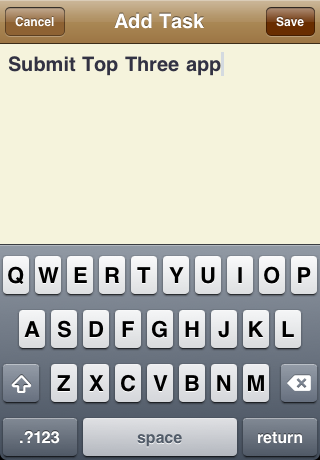 And so, I’m pleased to announce Top Three for iPhone, a new app that replaces the index card and helps you change the way you manage your priorities. Every day you get three new slots to fill. Choose the most important things and tick them off as you complete them. At the end of the day, or the end of the week, look back and see how many of your priorities you actually completed. This has been an interesting app to build, not because it’s technically difficult1 but because it’s functionally simple, and as a result there is a constant temptation to add more features. 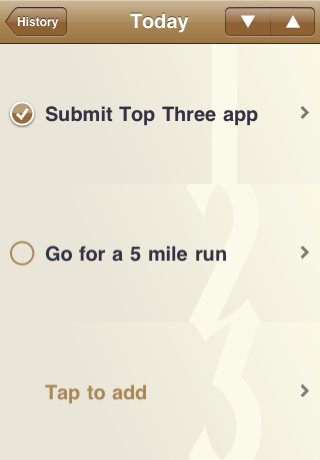 I’ve intentionally left out just about all of the things that you’d normally expect from a to-do app. 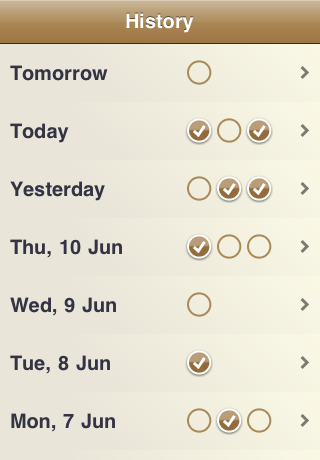 It doesn’t let you tag and categorize, it doesn’t let you search, it doesn’t let you order and re-order (beyond the three slots you see), it doesn’t let you set due dates and it doesn’t let you schedule tasks for far into the future – you can add and edit tasks for today and tomorrow and that’s all. There are literally hundreds of to-do apps in the app store, and this may be the most simple of them all, but I’m hoping that it’s amongst the most useful as a result. I have some free copies to give away to the first people who email support@southgatelabs.com – I just need you to tell me what your existing to-do app is (if any) and also promise to send me some feedback telling me what you think of it once you’ve been using Top Three for a week or two and to post a review on the iTunes App Store, positive or negative – you decide (note: these codes are valid in the US App Store only). Either way, if you decide to download the app and use it I’d love to hear from you. I hope you find it useful. Thanks in advance for giving it a try. We pulled the plug on Wingman yesterday. It was an itch. We scratched it. We never really got it working to our satisfaction, and as a result we never really got to the point where we were comfortable pushing it harder. We launched with an incomplete product. Possibly too incomplete? I still believe that if you launch and you’re not a little embarrassed you launched too late, but I’m coming around to the school of thought that says you shouldn’t launch at all. We put a throttle in place to ensure that we were not slammed by too many users before we were ready (a simple “enter your email address and we’ll send you an invite link when we’re ready”). We got slammed anyway. I’d probably try and do that differently, given the opportunity. Lots of people signed-up and used the service, kicked the tyres briefly, but moved on too quickly. We never really had a product that was compelling or a business model that was obvious. So, given the futility of flogging dead horses, this was an easy decision. I enjoyed working with Koz. I’m fortunate to be involved in other ventures that he is also working on and look forward to working with him again soon. I got my hands dirty with some code again for the first time in ages. I feel like I could hold my own now in a discussion about Rails and Git (two tools I hadn’t previously used). And I know a little about some of the challenges of creating an add-on for Firefox. I found a great font! We came up with a great structure for the venture, which is well suited to this sort of prospective product build I think. I will definitely use this sort of arrangement again in the future. When I get some more time I’ll write more about this. Posted on April 28, 2009 July 11, 2010 Author Rowan SimpsonCategories Southgate LabsTags Wingman2 Comments on Come in Wingman?